There are very few smartphones launches that I look forward to, but this year, that list has unexpectedly grown. Up until last year, the Pixel and the Note announcements were the only ones I looked forward to, but this year, Huawei and Honor have definitely joined the list. The Huawei P20 Pro was launched to tall claims of unmatched camera performance, which turned out to be almost all true, and given the shared heritage between Huawei and Honor, the Honor 10 was another smartphone I was looking forward to. Why? Well for starters, Honor’s flagships have always been spec’d to the hilt, sporting Huawei’s top-of-the-line processor mated with the highest amount of RAM logical. They’ve traditionally also thrown in ample storage. This was the Honor 8 Pro, which had every making of a flagship but lacked in the design aspect. The Honor 10 fixes that. You still get the best possible hardware, but now its all packaged into this one sleek, gorgeous looking smartphone. But are looks and on-paper specs everything? Let’s find out just how much the Honor 10 delivers on the specs it boasts of. Honor 10 Design: What Sorcery is this? There are two things about the Honor 10’s design that stand out about the Honor 10. First is the colour treatment of the phone. 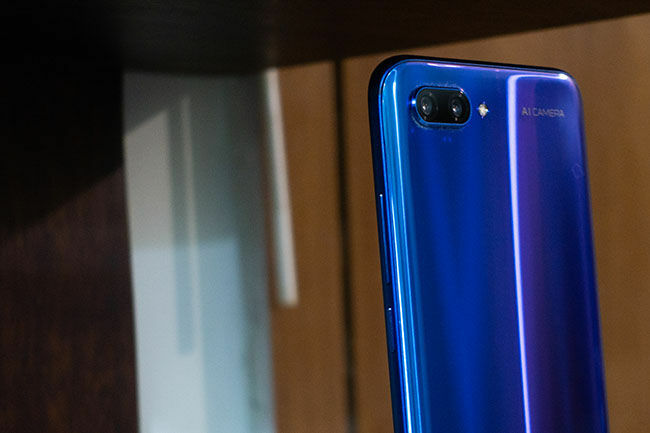 Huawei’s P20 Pro made quite a splash with its Twilight Purple, dual tone colour, however, the Honor 10 takes things even further. On this phone, the finish is so unique that it not only changes colour based on the angle you look at it from but also creates streaks of light running from top to bottom. It’s a finish unlike any other and the good thing is, its done well enough for the phone to not look tacky. The glass front and back are held together by a metal frame that has no flex at all. The three components are put together well. While the construction quality is impressive, it still lacks any kind of IP rating. While the back of the Honor 10 will instantly turn heads, the front is incredibly subtle. The only thing that stands out about the front of the device is the fingerprint sensor, which is embedded under the display glass. Before you get excited, no this is not the in-display fingerprint sensor, but it is quite close. The fingerprint sensor resides below the glass on the chin of the Honor 10, where a traditional capacitive fingerprint sensor would go. This is an ultrasonic fingerprint sensor that should not be affected by wet or greasy fingers, and in my usage, I found the claim to be true. I also found the phone to unlock just as fast as I’d expect a capacitive sensor to do its job. On the bottom, there’s a USB-2.0 Type C connector sitting next to a 3.5mm headphone jack. The Honor 10 is 7.7mm thick and manages to incorporate a headphone jack. Phones really don’t need to be any thinner, especially if it's going to mean losing features that have been a standard for decades. As far as the design goes, the Honor 10 stands out, from Honor’s own smartphones and from everything else that’s available today. The Honor 10 comes with a 5.84-inch IPS LCD display with a 19:9 aspect ratio, with an effective width of just 2.8-inches. What this means is that the phone is very easy to use with just one hand, a boon for people who have small hands like me. The display itself has a resolution of 1080x2280 and when you factor in the screen size, you’re looking at a display with a pixel density of roughly 432 ppi. Sadly, there is also a notch here and even though it's noticeably smaller than the one on the iPhone X, it still feels like something that could have been done without. You can “turn off the notch,” a feature we saw on the Huawei P20 Pro, but it doesn’t work as well on the Honor 10 because of the IPS LCD display which can’t turn the pixels off to achieve perfect blacks. 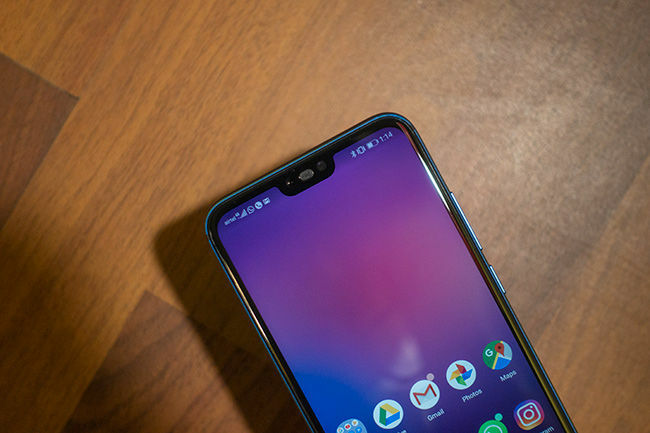 The notch trend is really annoying and takes more away from the display than it gives. Moving past the notch, the display can crank up to a maximum of 560 lux according to our lux meter. In case you’re wondering, it's just about enough to be legible under bright daylight, and thankfully, the reflections aren’t all that bad. 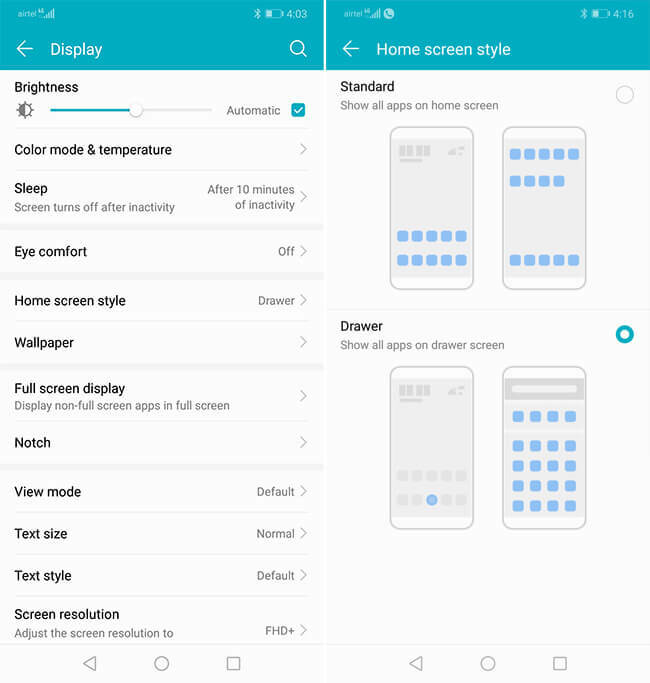 Because Honor uses an IPS panel, the colour accuracy is very impressive, but if you’re the kind of person who likes saturated displays, you can always just tweak the display settings to achieve the saturation levels. So yes, this is essentially a 1080p display that only supports standard colour gamut. This means there’s no DCI-P3 colour support and no HDR video playback compatibility either. This is something we would expect from a phone that tries to call itself a flagship. In Honor’s defence, no other smartphone offers HDR panels in this price range, but that isn’t really a justification to leave some features out. If anything, Honor could have earned itself an advantage had it used a higher resolution display or procured a panel that supported HDR video playback. Overall the display is functional, colour accurate and can go between bright enough for daytime to dim enough for use in pitch dark. This is something you can get from a lot of smartphones that cost a whole lot less. The lack of higher pixel density or HDR support is an opportunity lost for Huawei so as to be able to set itself apart from the competition. I should probably state at the very beginning of this section about my bias when it comes to gauging performance. 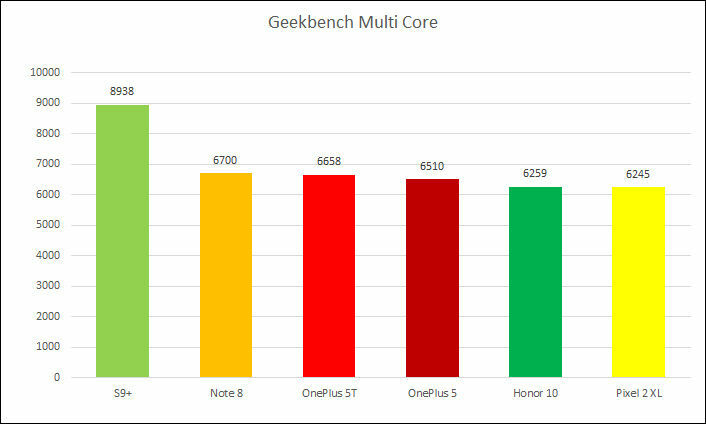 For starters, I am not convinced that benchmark numbers are an accurate portrayal oh a phone’s performance, simply because we’ve seen multiple cases of smartphone manufacturers gaming benchmark tests. Second, I do feel that if a phone performs well in day-to-day usage (average to aggressive), it’s a far stronger indicator of performance than synthetic benchmarks. However, our testing methodology still relies on a combination of benchmark and real-world usage scores, so I will discuss both here. The synthetic benchmarks reveal that the octa-core Kirin 970 processor falls squarely in the Snapdragon 835 segment when it comes to performance. The processor has four Cortex-A53 cores clocked at 1.8GHz and four big Cortex-A73 cores clocked at 2.3GHz. Interestingly, this setup is identical to what was seen on the Kirin 960 processor, including the clock-speeds. What has changed though is the GPU. The Kirin 970 has a Mali G72MP12 graphics processor, which is 50% denser than the Mali G71 on the Kirin 960, but also has a lower clock-speed (764 MHz. vs. 1037 MHz). When putting the Honor 10 through a flurry of benchmark tests, we see that it just about keeps up with smartphones that run on the Snapdragon 835 chipset. 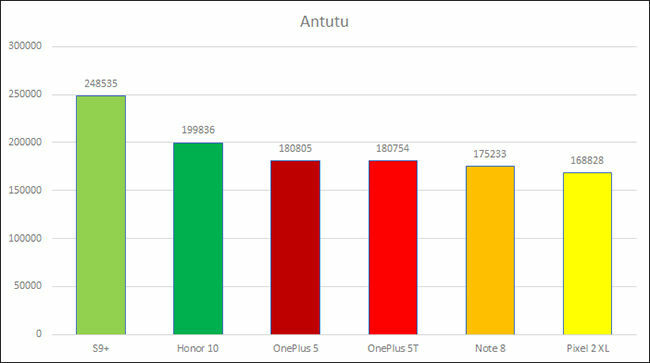 While the Honor 10 manages to eek ahead of the OnePlus 5T and the Pixel 2 XL on AnTuTu (199836, 180754, 168828 respectively), it loses out to all but the Pixel in Geekbench’s single and multi-core benchmark. We note the same behaviour in our GFX Manhattan 3.1 tests and even the 3D Mark suite of benchmarks. What was rather surprising though was the rate at which the phone was heating up during the testing. In fact, during one run of 3DMark’s Sling Shot Extreme test, the phone gave an over-heating warning and shut the benchmark down. This same heating is noticed even when taking photos, especially in Pro mode. Moving past synthetic benchmarks and into real-world use, I’ve been using the phone as my primary and only smartphone for about a week and I have to say, its been surprisingly smooth sailing. After setting up the phone with all my apps and data, there’s been practically no reason to complain. 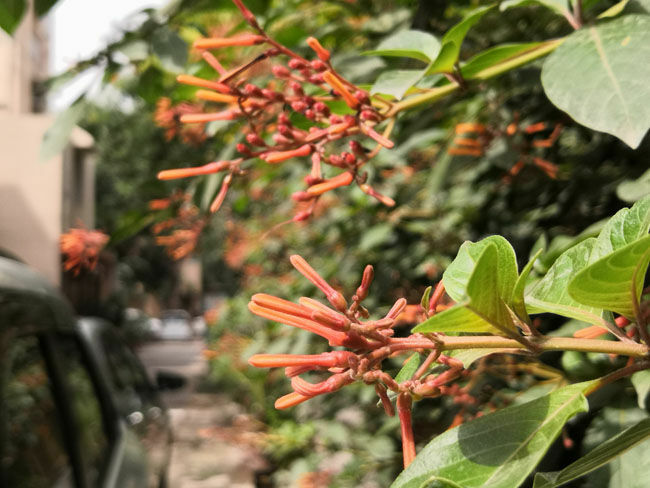 Everything works acceptably fast and smooth on the Honor 10, whether its multiple rounds of Need for Speed, a few matches in Injustice or even if its to edit the RAW photos using Snapseed. There’s no lag, no stutter and most importantly, no crashes. The Honor 10 has become a very reliable daily driver for me. Before this, I was using the Google Pixel 2 XL as my daily driver and honestly, the Honor 10 has not let me down. Sure, the benchmark numbers peg this phone’s performance more in line with last year’s Snapdragon 835. The concern with this is that the OnePlus 6 which will be powered by the Snapdragon 845, along with all other flagships of this year, is only a day away from being launched, officially raising the bar on performance. Then there is also the concern of whether the Honor 10 will be able to maintain its performance over the course of the year, as apps and OS receive updates. The Honor 10 feels like it may be starting off at a disadvantage when it comes to the modernity of its hardware, but from what I’ve experienced in the last few days, it sure doesn’t feel any less than a top-tier performer. The Honor 10 runs on EMUI 8.1, built on Android 8.1 Oreo. This is the same OS that the Huawei P20 Pro runs as well. But there were some differences in its behaviour. While setting up the phone, I was unable to copy data from my old phone onto the Honor 10. Honor’s Phone Clone app just wouldn’t establish the WiDi connection, no matter how much I tried. After about an hour of trial and error, I finally gave up and decided to set the phone up as new. I had to spend another two hours copying all my data from one phone to the other via a USB drive, along with manually downloading all the necessary apps. Finally, once all the data stuff was done, I moved into display settings and changed the colours from Vivid to Natural so as to get a more colour accurate representation of colours. 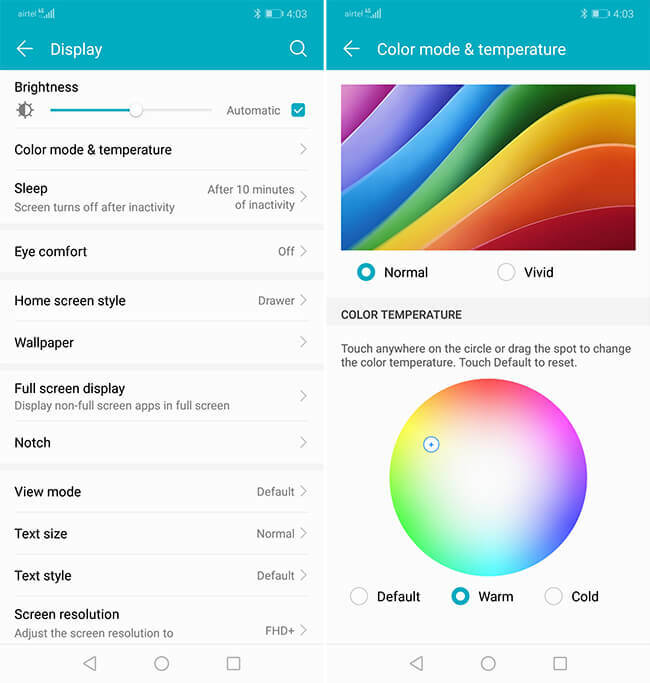 In the Colour mode setting, you can not only select between the two-colour modes, but also choose the colour temperature of the screen from either one of the three presets, or anything from the colour-wheel. The next thing I did was change the launcher layout from the default, iPhone like implementation to the standard Android layout with an App Drawer. Once the phone was set up, using it has been almost a total treat. It hasn’t crashed a single app yet and even the 4K video shot from its own camera in HEVC playback without any stutters. The built-in theme store opens the door for a major visual overhaul, something I particularly liked. Unfortunately, there is still no way to apply custom icon packs downloaded from the Google Play Store without using a custom launcher. While the OS is beautifully optimised with the hardware, not letting any app or gesture falter, there is one major problem with EMUI 8.1 that ships on the Honor 10 and that is bloatware. There are a large number of Huawei’s own apps, a few social media apps, some games and even some utility apps that are pre-installed on the phone. Some of these like the social media apps and games you can remove and others you cannot. For example, EMUI has its own Mail app which cannot be removed and feels mostly like a waste of space since most people just prefer to use Google’s own Gmail app for managing e-mails. OEMs really need to start making their operating systems leaner and trim the fat off the software. Removing or allowing users to remove unneeded apps would be a great start. Overall, EMUI 8.1 is surprisingly stable and functional. I’m typically very wary of non-stock Android-based smartphones, but my experience with EMUI 8.1 on the Honor 10 has been pretty good. The bloatware is annoying, but when you have 128GB of on-board storage, you don’t really feel the pinch for space. The Honor 10 comes with a 24-megapixel RGB sensor and a 16-megapixel monochrome sensor that make up its dual camera assembly. Both the cameras sport lenses with an f/1.8 aperture. The Huawei P20 Pro had very impressive camera performance thanks to the over the top camera specs, but the Honor 10 is a lot more modest. What did raise my eyebrow was the 24-megapixel front-facing camera with a pixel pitch of 1.8 μm, which is larger than what primary cameras on more expensive flagships sport. Lets first talk about the primary cameras. Only a few camera samples are shared in this review, and they have been downsized for easy web viewing. If you'd like to see a whole gallery of untouched camera samples, head over to this link here. In daylight, both the primary cameras can take impressive photos with very little loss in detail. The detail loss occurs due to two factors; the JPG compression that is applied to the RAW sensor data to convert it into a readable image file and if the camera deems fit, the application of noise reduction. I did notice that in good night, the Honor 10 was retaining a lot of the detail that is otherwise lost. The detail in skin is often the first to be sacrificed, with the texture changing into a smooth, brown coloured surface. That is not the case if you shoot with the Honor 10 in good light. In good light, even the autofocus will be reliable at least 8 out of 10 times. You can shoot in the auto mode, but if you truly want to shoot without a care in the world, you should turn on the AI assist mode. Turning this feature on will engage the NPU built into the Kirin 970 processor which will help automatically detect the subject and adjust the shooting settings accordingly. I was very surprised to see that the AI was accurate 100 percent of the times, whether I tried shooting my dog in good light or trying to photographer obscure looking food in the really bad light. The AI sure works well at identifying the subject and in most cases, does apply the right kind of tweaks to get the perfect shot. For example, every time I tried taking photos of individual people, the AI kicked into portrait mode. Once the sun has gone down, things change a little in terms of cameras performance. Photos have visibly more aggressive noise reduction applied to them which is apparent from the loss in texture on surfaces with texture. Colour reproduction also takes a hit with slight shift in hues across the colours blue and green. There is also a noticeable loss in contrast. Interestingly, all this behaviour I speak of applies to the RGB sensor, but once you shift to monochrome, things change. Suddenly, you can shoot in Pro mode and use a high ISO value because noise will turn into gorgeous film grain. The low contrast will lend a retro feel to your image. 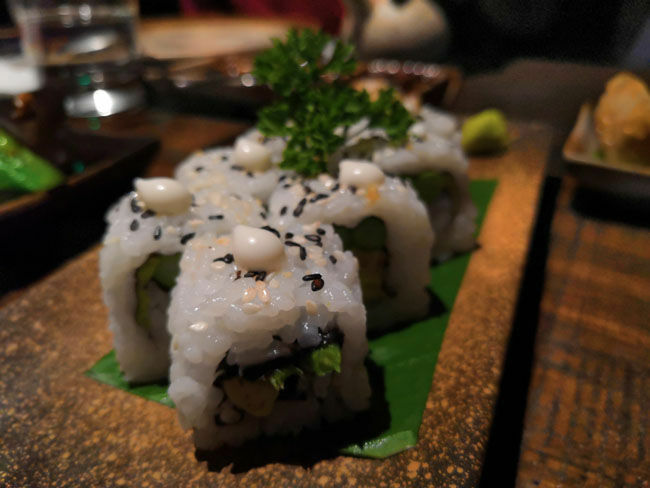 Workarounds aside though, the Honor 10’s primary cameras can go up to ISO 3200, shooting at which will have visibly poor image quality. If you can keep the ISO at 1600 or below, you should be able to walk away with images that are definitely usable. The best part, however, is that if you shoot in RAW, yes, the high ISO RAW files will have more noise than their JPG counterpart, but through editing, you will not only be able to clean up much of the noise, but also retain a lot of the detail and colour. With Adobe Lightroom and Snapseed, RAW editing is now possible on the phone itself, so you don’t even have to bother with moving the images to a desktop. The Honor 10 boasts of not just a high-resolution sensor for its selfie camera, but also a 1.8 μm pixel pitch. The result is not just high-resolution selfies, but also very impressive low light performance. When I switched to the front-facing camera to take some selfies (which rarely happens), the first thing I noticed was the lack of autofocus. Most OEMs don’t offer AF capabilities for the front-facing camera, so it is well within the norm for Honor to not do the same, but it would have definitely been a big notch on their belt if they had the feature. The selfies in any case, look pretty good, especially those shot in low light. The camera app is applying some smoothening by default and a lot of aggressive JPG compression. Selfies shot in low light and examined on a large screen show significant compression loss. Where all this won’t matter is when you’re taking selfies in poorly lit situations. 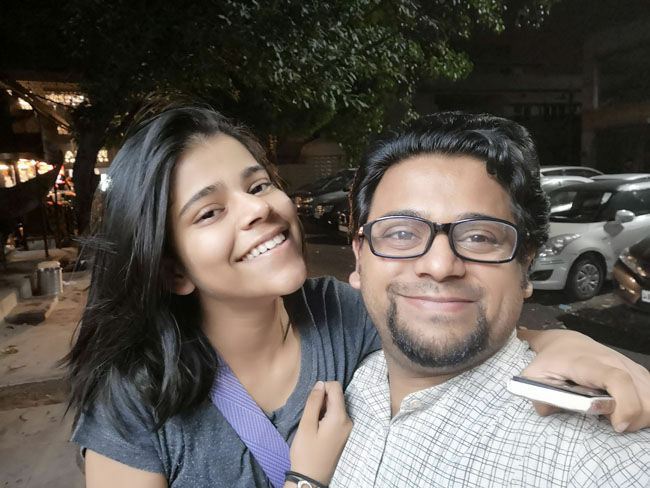 The low light performance of the Honor 10’s selfie camera is definitely a cut above what’s available in this segment, but the camera app could use a little more refinement and possibly, better JPG algorithms which apply lesser compression. The Honor 10 packs a 3400mAh battery which supports fast charging. There is also a fast charger in the box. In the week I’ve been using the Honor 10, the phone easily lasts over a whole day’s use. Unplugging the phone from the charger by 8 in the morning, the phone generally required a recharge the next day even on days where my usage was higher than normal (not on benchmarking days), the battery still adequately lasted till bed-time. 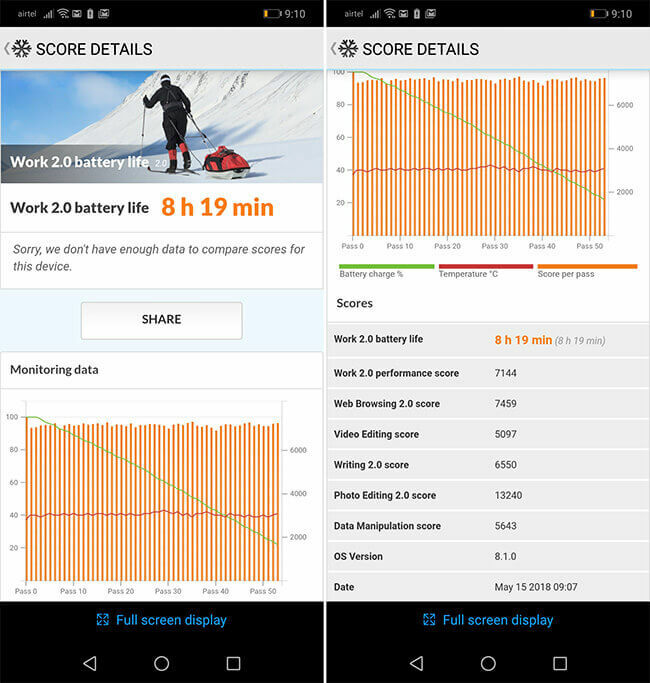 This behaviour is corroborated by the PCMark battery test, on which the Honor 10 recorded 8 hours and 21 minutes for the battery to go from 100 to 20 percent. The phone charges up in under an hour and a half, with the first 30 percent of the battery charging faster than the rest of it. There’s really not much to write about the battery honestly, given that it performs well within the expected norms. 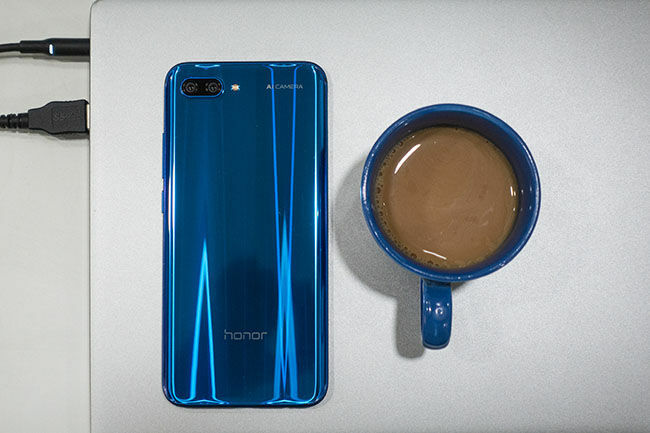 The Honor 10 is a striking smartphone with its Aurora Glass finish that gives the back its unique look. The Phantom Blue colour variant we reviewed was an eye-catcher, with the back looking like a joyous mix of blue, purple, white streaks and at times, pink. The 5.84-inch display in a 19:9 aspect ratio means the width is notably narrow, making the phone surprisingly easy to use with just one hand. The performance of the phone is also good, with no hiccups or lag, but the phone I had was heating up way too much for it to be normal. I have never seen any phone hit 55.7 degrees during a 3DMark run and on another occasion, shut the app down due to overheating. I was even more surprised to see the phone heat up around the edge with the camera module after shooting maybe five photos in pro mode. Overlooking the heating, I did enjoy taking photos from the Honor 10. While the phone produces great images during the day, shooting RAW is a far better option if you want better images in low light. It produces impressive selfies too and has enough battery to get your well through a busy workday. The only apprehension I see would be with the fact that Honor is using the Kirin 970 processor, which doesn’t perform poorly today, but there is no telling how the phone would fare in a year from now, after a few software updates.